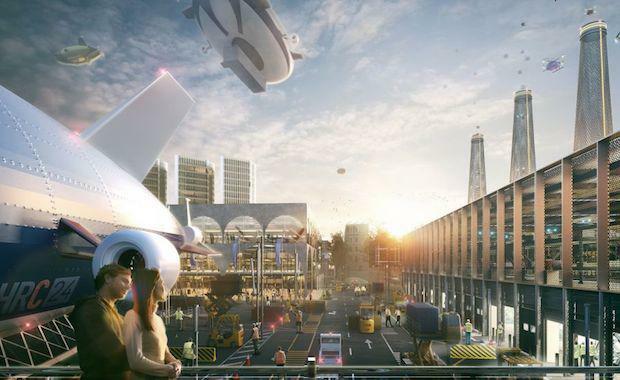 Renowned architects have revealed designs for a 190,000 person town that would be built if the Heathrow Airport closes and is replaced by the new Thames Estuary Airport. Three architectural firms have been commissioned by Transport for London to conceive the best possible ideas for ‘Heathrow City' and are set to include new park land, a scientific research centre and a factory for self-made property to make it easier for people to build their own homes. One of the three designs by leading firms Rick Mather Architects, Hawkins Brown and Maccreanor Lavington could be put in place if Heathrow is replaced by a new Thames Estuary airport, a plan supported by London Mayor Boris Johnson that is currently under consideration by the Whitehall-appointed Airports Commission. London Mayor Boris Johnson has labeled the potential closing of Heathrow Airport, the largest airport in Europe, as a “fantastic opportunity for London”, allowing new opportunity to develop a garden city or a new royal borough. Mr Johnson has advised that travellers needed to shift their mindset if this happened and catch public transport to reach his proposed four-runway airport in the Thames Estuary. His argument for the closure and redevelopment of Heathrow Airport and the development of a large airport at the Thames Estuary was that Britain needed to maintain its position in global aviation and reach emerging markets by expanding the hub airport. "Ambitious cities all over the world are already stealing a march on us and putting themselves in a position to eat London's breakfast, lunch and dinner by constructing mega airports that plug them directly into the global supply chains that we need to be part of,” Mr Johnson said. "Those cities have moved heaven and earth to locate their airports away from their major centres of population, in areas where they have been able to build airports with four runways or more. For London and the wider UK to remain competitive we have to build an airport capable of emulating that scale of growth. "Anyone who believes there would be the space to do that at Heathrow, which already blights the lives of hundreds of thousands of Londoners, is quite simply crackers. "Mr Boris’ adviser has suggested the transformation could happen within 20-years and would come with a price tag of about $15 billion. Mr Boris has said he is determined to make major infrastructure decisions now that will contribute to the wider and longer-term view for London and the UK. Population growth in London is expected to skyrocket from today’s 8.3 million to 10 million people by 2030 and 11 million by 2050. The new Thames Estuary Airport is predicted to cost $50 billion. In this design, which was created by Rick Mather Architects, 190,000 homes would be spread among ten centres, connected by the former runways in a bid to utilise the existing infrastructure. If this plan were to go ahead, developers would also create a research, technology and manufacturing hub. Homes would be made up individual houses, terraces, mansion blocks and communal square, seeing the site transform into a new hub city. Gavin Miller, partner at Rick Mather Architects, said: “Our proposal ‘The Transforming City’ explores the natural emergence of a vibrant and integrated new hub city from the existing airport structure, embedded in its setting and wider landscape, singular and distinctive, at one with its immediate setting and locality, yet fully tuned for regional, national and international opportunity". Director Gerrard Maccreanor said Heathrow Airport had outgrown its current location. “It is not only a nuisance for many of the residential neighbourhoods in West London but it is also a hindrance for growth,” he said.